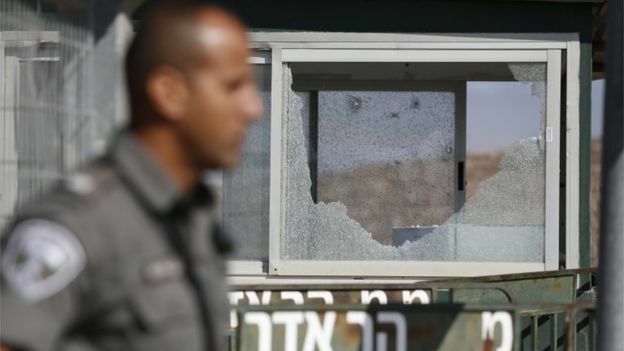 Three Israelis have been shot dead by a Palestinian at the entrance to the Jewish settlement of Har Adara in the occupied West Bank, Israeli police say. The gunman, a 37-year-old from a nearby village, was also shot and died later. Israeli Prime Minister Benjamin Netanyahu blamed the attack on Palestinian incitement. It came as Donald Trump's Middle East envoy Jason Greenblatt arrived in Jerusalem to try to revive Israel-Palestinian peace talks. Police say the gunman, identified in Israeli media as Nimer Jamal, struck after he raised suspicions of security personnel at a rear gate at Har Adar. He shot his victims - two security guards and a border policeman - at close-range and seriously wounded another person, before being shot by security forces. The gunman was a father-of-four who had an Israeli permit to work in Jewish settlements along the boundary of the West Bank, Israel's internal security agency said. He came from the village of Beit Surik, about a mile east of Har Adar. The area is about 18km (11 miles) north-west of Jerusalem. No group has taken responsibility for the attack, although Gaza-based Palestinian militant organisations Hamas and Islamic Jihad welcomed it. The head of the Information Office of Fatah, the political faction of Palestinian President Mahmoud Abbas, said Israel bore responsibility for the attack, because of its "continuous aggression" against the Palestinians. 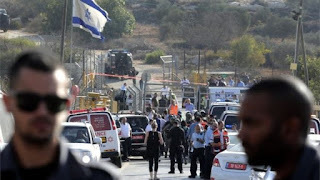 Israeli Prime Minister Netanyahu said the attacker's home would be demolished and relatives' work permits revoked. He called on Mr Abbas to condemn the attack unequivocally.